Following Alexander Povetkin’s refusal to fight Cuban Luis Ortiz for the “regular” WBA heavyweight world title, the chances of the "Russian Knight" fighting a rematch with Wladimir Klitschko are becoming ever slimmer. The 34-year-old Russian boxer Alexander Povetkin has refused to fight 35-year-old Cuban Luis Ortiz for the title of "regular" WBA world heavyweight champion. Fans of 2004 Olympic super heavyweight champion Povetkin received the news with undisguised disappointment. The last time Povetkin stepped into the ring was on October 5, 2013, when he lost on unanimous counts to the 38-year-old world champion Wladimir Klitschko in Moscow. After that fight, Povetkin himself and his close entourage admitted that they were eagerly waiting for a rematch. The first defeat in his professional career was written off as being due to the constant changes in his coaching staff and the wrong choice of fighting tactics. During the last six months, the “Russian Knight”, as they call Povetkin in Russia, has changed his promotional company and hired a new coach – former boxer Ivan Kirpa - but has been unable to get close to a rematch with Klitschko. His refusal to box with Ortiz has now distanced himself further from this goal. Back in March, the World Boxing Association (WBO) ordered Povetkin to enter the ring and fight with Ortiz. Their duel was provisionally scheduled for late May or early June in Moscow. A victory for Povetkin over Ortiz could help him regain confidence and become eligible for a new fight with Klitschko. Now the boxer may pay the price, as the Irish-British boxer Tyson Fury and American Dereck Chisora​​ have the chance to become contenders for Klitschko’s title. According to Povetkin’s promoter Andrew Ryabinsky, the Russian side is not satisfied with the terms offered by the Cuban boxer. "Alexander is simply not familiar with the feeling of fear. Povetkin is a very brave man. Believe me, he's ready to box with the strongest contenders. I was the one who didn’t want to go ahead with the fight with Ortiz, he didn’t. We were not happy with the terms put forward by the opposing team, and it's not just about money," said Ryabinsky. According to famous boxer and former WBC world Flyweight champion Yuri Arbachakov, Povetkin’s team’s refusal may be motivated by the boxer’s psychological state. "Ortiz is a strong boxer, with many aces up his sleeve. The Cuban has had no defeats to date in his professional career and it is quite risky for him [Povetkin] going against a such a fighter after losing to Klitschko," said Arbachakov. "The Russian may not be ready for a serious onslaught from the Cuban. Especially since Ortiz specializes with fighters similar in style to Povetkin. I have seen several of his fights and I can say that the Cuban can easily cope with promising boxers. Perhaps now Povetkin needs a weaker opponent." His refusal to box with Ortiz will have an adverse effect on the Russian heavyweight’s rating. A possible way out would be to move the athlete to a lighter weight category (the lowest heavyweight class – 90 kg). 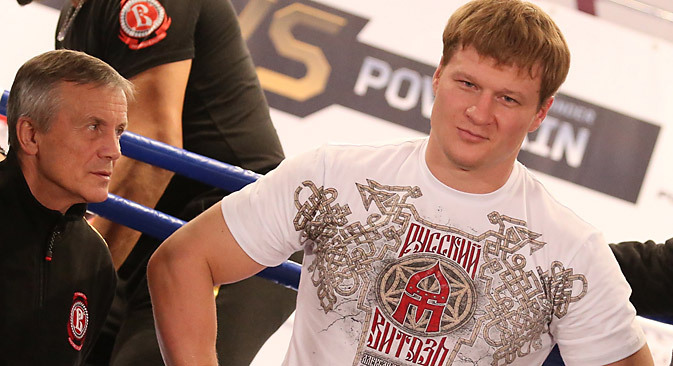 Arbachakov, however, believes that Povetkin, whose weight is now 103 kg, will not be able to change his role. "The last time Povetkin weighed 90 kg was more than ten years ago. Even with the strongest desire, the Russian could not return to the first heavyweight [class]. Of course, there he could have become one of the best, but the time has already passed. He must accept this and continue to improve his skills,” said Arbachakov. “In boxing, everyone loses; even Vladimir Klitschko has been defeated. In my opinion, Povetkin has not had his last word in boxing yet and with a proper training system he will still be able to fight for the most prestigious titles in the super heavyweight division." The boxer’s head coach Ivan Kirpa believes that it is too early for Povetkin to enter the ring. "We need to psychologically prepare Povetkin for his next big battle. It is an entire built up preparation period, and it does not start three months before the fight, but long before it,” said Kirpa. “We have been working with Sasha for just over two months. The process should be lengthy and thorough – it is necessary to live close to a boxer to know all of his features, his every character trait, to be able to correct his mistakes and develop all his strengths. Alexander is capable of beating Klitschko in the future. However, I cannot set an approximate date for his next battle yet." Povetkin’s record is 27 fights in professional boxing, in which he has scored 26 wins (18 by KO) and suffered one defeat. There is a high probability that the next opponent for the "Russian Knight" will be Bulgarian Kubrat Pulev or American Bryant Jennings, both of whom are undefeated. The fight will take place in the second half of 2014.